Estes Proto X Nano Quadcopter – New Colors! Home » New Release » Estes Proto X Nano Quadcopter – New Colors! The nano-sized Proto-X radio-control quadcopter has taken the world by storm, winning prestigious international awards and rave reviews from new and experienced fliers alike. The quality of technology and performance it offers has no equal at such a low price. This tiny quad has attracted such a large following that it now has its own web site: protoquad.com! This wee quad even features an Auto-Upright system for self-correcting, beginner-friendly flight. Many larger quadcopters do not even include this amazing feature! 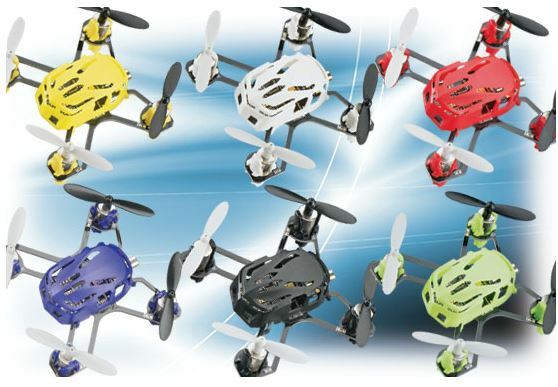 And now, the Proto-X is available in a rainbow of bright colors: green, black, purple, red, white and yellow.